Home | News & Media | Promoting Youth Leadership | Extremely Together: Young people coming together against violent extremism. Extremely Together: Young people coming together against violent extremism. Recent attacks in Brussels, Lahore, Paris and Mali, the ongoing foreign fighter phenomenon, the thousands of young people who continue to join radical groups such as ISIS and Al Qaeda, and the emergence of far right extremist groups in many countries across the world, remind us that the threat from violent extremism is a global and generational struggle. 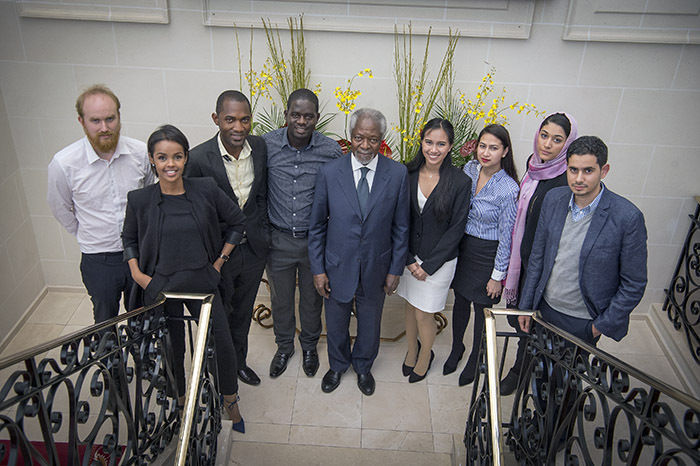 On 12 April 2016, the Kofi Annan Foundation, with the support of the European Commission and One Young World, brought together 10 young leaders. In the months to come they will steer the way in countering and preventing violent extremism. 10 exceptional leaders with proven track-records in preventing and countering violent extremism in their communities were selected from over 500 applications from 72 countries. Under the banner “Extremely Together” they will pool ideas, share experiences and produce a toolkit enabling them, their peers and thousands of young people around the world, to turn the tide in the fight against extremism. “We will show that no matter where we are from, what faith we believe in, ethnicity we have or belief system we hold dear, we will not be silenced by the destructive, divisive and simplistic narratives told by a minority of extremists”, Ilwad Elman from Somalia said. “Our vision for the future carries more hope, is more compelling and we aim to demonstrate that in the months to come and hope that many will visit our soon to be finalised website and follow us on social media”. Extremely Together will equip young people in communities around the world with tools and methods and inspire their peers with perspective where there is hopelessness, trust where there are misgivings, and unity where there is division. At the meeting in Geneva, the group vowed to tell the world a better story, to counter extremist narratives and encourage likeminded efforts globally. With extremist groups exploiting the grievances and identity crises shared by many young people, using social media platforms to radicalise and recruit our peers, the next generation is perfectly placed to lead counter-extremism and build a peaceful and more stable world. “Nobody can do this alone Neven Mimica, European Commissioner for International Cooperation and Development said. “We particularly need the support of our young people, their energy and passion, their innovation, insight and knowledge” he added. “This is why I am thrilled about our partnership with the Kofi Annan Foundation, which is aiming to empower young people to harness their creativity and take a leading role in the fight against violent extremism by using the most effective communication and educational tools”. “We vow to be extremely constructive, extremely engaged, Björn Ihler from Norway said. “We come from diverse backgrounds and want our name to express the unity we all felt when first meeting one another. We truly are extremely together in this cause”. Ilwad Elman, Extremely Together’s Young Leader from Somalia, who works to deradicalise members of Al Shabaab and promote gender equality in Africa. Bjorn Ihler, Extremely Together’s Young Leader from Norway and survivor of the Anders Breivik terrorist attack, who uses art to counter extreme right wing narratives. Arizza Nocum, Extremely Together’s Young Leader from the Philippines, whose initiative builds libraries to promote education and interfaith as a preventative solution to extremism. Syed Ali Abbas Zaidi, Extremely Together’s Young Leader from Pakistan, who founded 3 non-profits focusing on counter extremism, social innovation, and interventions at different intersections between society and state. Hajer Sharief, Extremely Together’s Young Leader from Libya, working to engage women and young people in peace building. Ndugwa Hassan, Extremely Together’s Young Leader from Uganda, who works to train teachers, Imams and young people in countering violent extremism. Mimoun Berrissoun, Extremely Together’s Young Leader from Germany, and co-founder of 180° Wende, a Cologne-based organisation engaging with young people affected by extremism. Fatima Zaman, Extremely Together’s Young Leader from the United Kingdom, who works to research and advise on counter-extremism policy. Jonah Obajeun, Extremely Together’s Young Leader from Nigeria, whose work advocates education-based solutions to prevent radicalisation and extremism. Zaid Al Rayes, Extremely Together’s Young Leader from Syria, who aims to create economic opportunities for the young to show alternatives violent extremism. The Kofi Annan Foundation is grateful for the support of the European Commission and One Young World. Extremely Together – An initiative with the next generation to counter violent extremism.